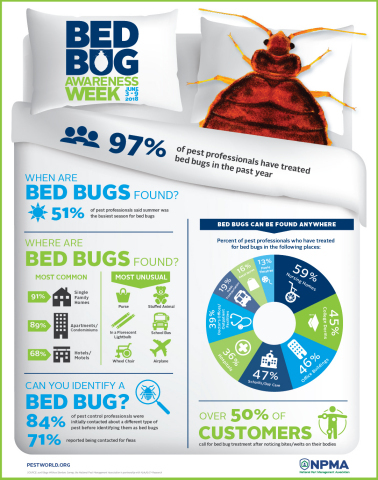 FAIRFAX, Va.--(BUSINESS WIRE)--The National Pest Management Association (NPMA) today released the findings of its 2018 Bugs Without Borders research, which surveys pest control professionals on the prevalence of bed bugs here in the U.S. The survey reports that 97 percent of pest professionals treated for bed bugs in the past year and more than half say summer is the busiest time of year. The results also reveal just how frequently bed bugs are confused with other pests. In fact, 84 percent of pest control professionals reported being contacted to treat another type of problem only to discover bed bugs present instead. The most common doppelganger? Fleas, as 71 percent of respondents reported being contacted to treat a suspected flea problem when in reality the customer had bed bugs. The NPMA just released its new 2018 Bugs Without Border survey. Summer travel season is the time to watch out for these pests.